Welcome to the first hop of my new Stampin' Dreams Blog Hop. If you're wanting to hop with us, please send a request to the Facebook Group of the same name. Places are limited. From June, this group will hop on the third Thursday of the month. You are currently visiting Jessie Holton from Australia. 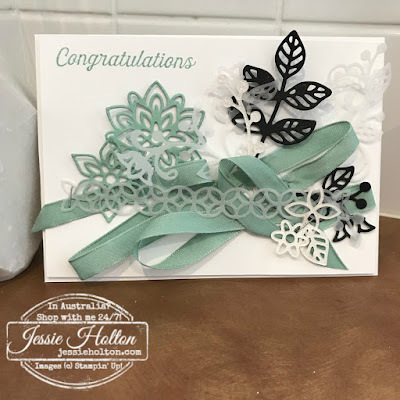 I hope you enjoy my cards showcasing my favourite Retiring Product - everything Mint Macaron!! 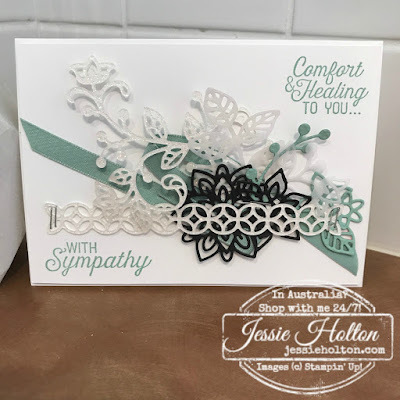 This is my favourite colour out of all the colours offered from Stampin' Up! And there are a lot haha! 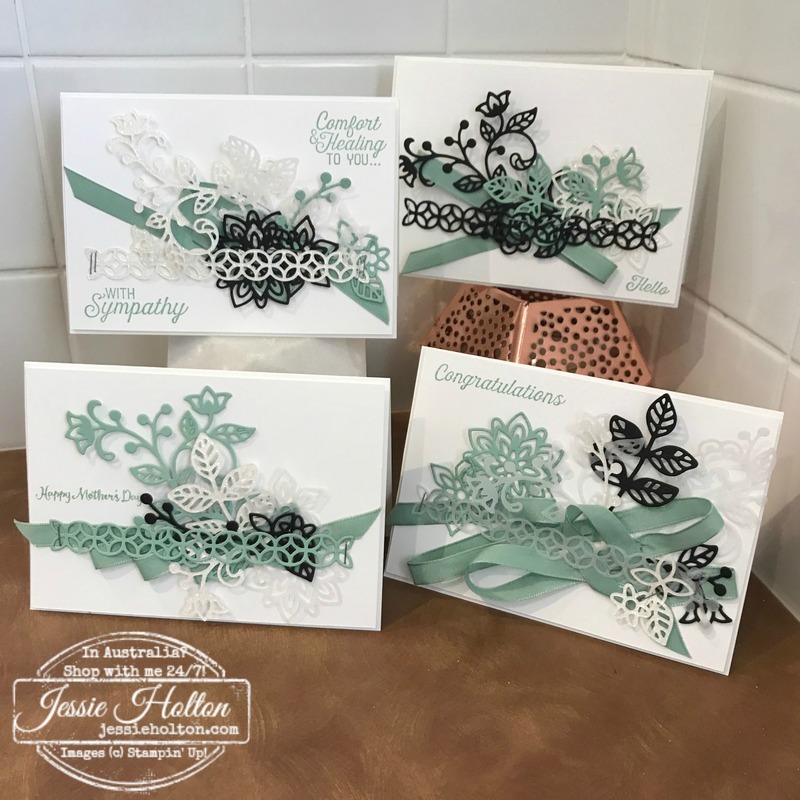 I've decided to make some minimal stamping cards & use the gorgeous Flourishing Phrases Bundle - this bundle is not retiring but it had most of the sentiments I needed & I like working with just one or two sets. 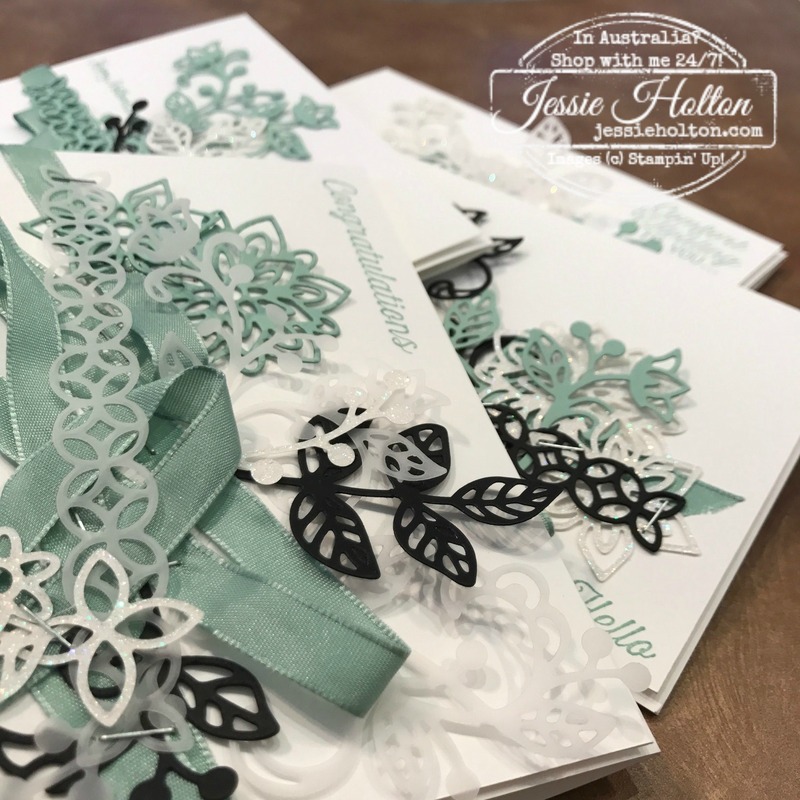 I've die cut all of the thinlits from this bundle for each Mint Macaron, Basic Black, Vellum & Dazzling Diamonds Glimmer Paper. Then I've mixed them up for four separate cards using Thick Whisper White cardstock for both the base & extra layer. There are Dimensionals under the layer. I've also used the Mint Macaron Sheer Ribbon & I've stapled the lot together, rather than using glue. But a really good hack for this is to use a few strips of Tear & Tape on the back of the cardstock before you die cut it & then you just peel off the backing after you've cut! Hey presto! This first card is for a friend, who I've been really slack in thanking for some beautiful little mittens she made for Ryan. My step sister is getting married this week. Opulence is her middle name lol so I thought I'd add a lot of ribbon this one. 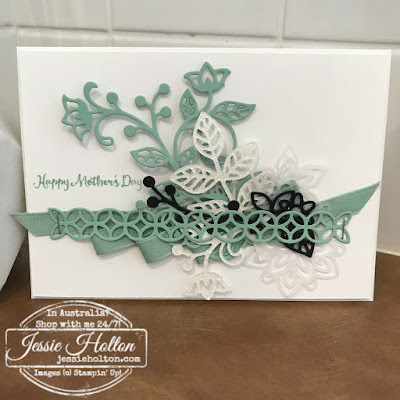 I also cut the largest die cut (Vellum) in half so I could fill out the card a little more. A Mother's Day Card for my mother in law. She loves mint too, so I've used the card with the most mint on it for her. The sentiment used in this card is from the retiring Succulent Garden stamp set. 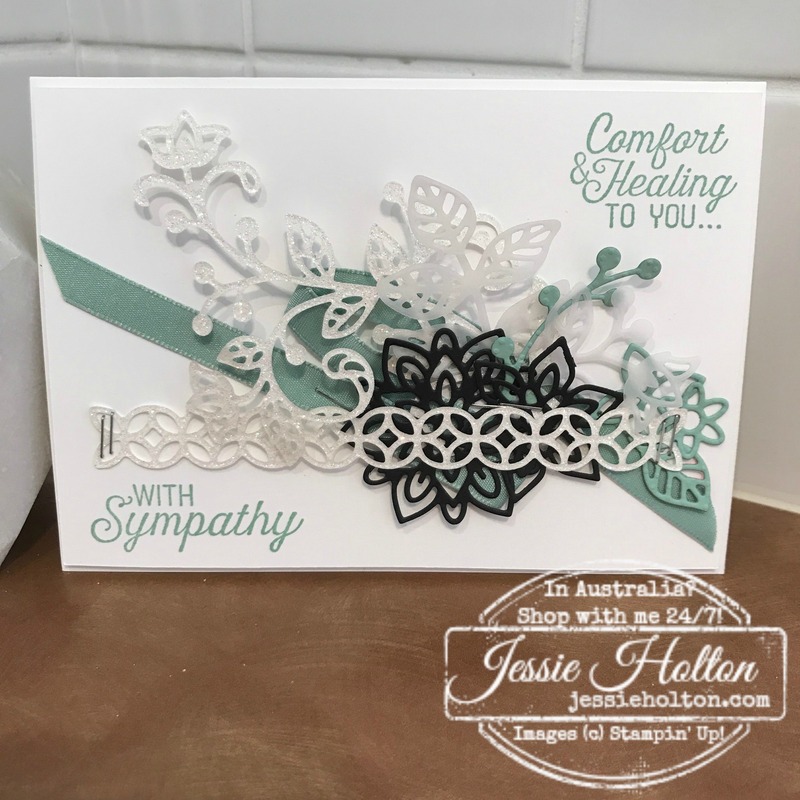 And sadly, a sympathy card for some friends who went into labour early & lost their darling little boy at just 20 weeks. Such sad news. 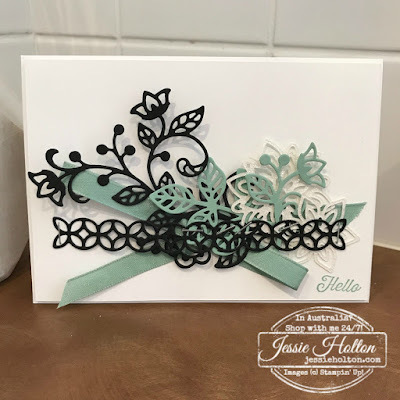 And here I've done some close ups to try & show you how gorgeous the Dazzling Diamonds Glimmer Paper is. The Glimmer picks up colours of mint & pink. The photos really don't do it justice! I hope the projects you've seen here on my blog today have inspired you & brightened your day. You are currently visiting Jessie Holton. Please see the list below & hop through all of the people on the list to see all our projects. You don't want to miss any! 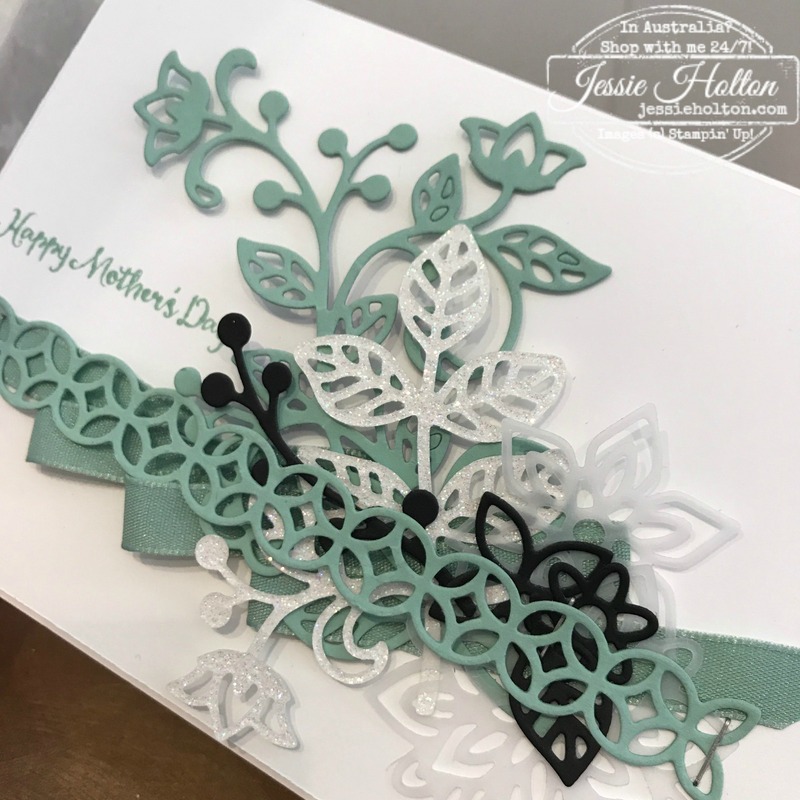 Remember to use my May Hostess Code PPHYT9VD at the bottom of your Shopping Cart & get a handmade card & a gift from me at the end of the month & qualifying orders (over $50) will also go into the draw for the gorgeous retired Thankful Life Stamp Set! Please note, you must reside in Australia to order from me.